WASHINGTON — NASA signed an agreement in September with a foundation to support initial studies of a privately funded mission to a potentially habitable moon of Saturn. 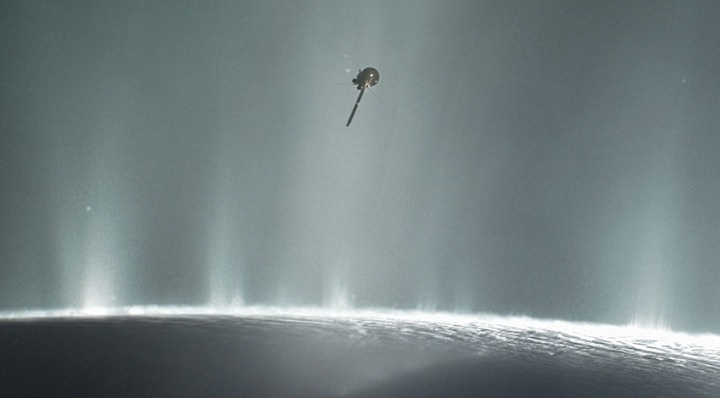 The unfunded Space Act Agreement between NASA and the Breakthrough Prize Foundation, initiated with little public fanfare, covers NASA support for initial concept studies, known in NASA programmatic parlance as “Pre-Phase A,” for a mission to the moon Enceladus, an icy world believed to have a subsurface ocean of liquid water and plumes that eject that water through the surface into space. The agreement between NASA and Breakthrough involves no exchange of funds. NASA estimates its cost of carrying out its responsibilities under the agreement to be $72,384. The agreement, first reported by New Scientist, offers few details about the proposed mission itself. A companion document for the agreement notes that the foundation’s Breakthrough Watch program “seeks to evaluate near-term missions to objects in the Solar System, including Enceladus,” that would search for signs of life there. “The Enceladus Mission is considering novel low-cost approaches, one of which uses solar sail technology to flyby the moon of Saturn to collect scientific data. Pete Worden, the former director of NASA’s Ames Research Center who is chairman of the Breakthrough Prize Foundation, mentioned at the NewSpace Europe 2017 conference in Luxembourg last November that the organization was considering some non-traditional concepts for an Enceladus mission, including using solar sails. A Breakthrough Prize Foundation spokesperson, contacted by SpaceNews the day of those comments, said the agreement had not yet been finalized. A NASA spokesperson did not comment on the agreement then. The Space Act Agreement was, in fact, signed Sept. 13, according to the documents posted online. Worden signed the document on behalf of the Breakthrough Prize Foundation and Thomas Zurbuchen, NASA associate administrator for science, signed for NASA. Even after the agreement was signed, though, neither NASA nor Breakthrough were willing to talk about it. Interviewed during an event at the International Astronautical Congress in Bremen, Germany, Oct. 2 about a separate Search for Extraterrestrial Intelligence initiative by Breakthrough in South Africa, Worden said the foundation was not yet ready to make an official announcement about the study. A Breakthrough spokesperson, contacted by SpaceNews Nov. 8, promised to “circle back” about the agreement, but did not follow up. A NASA spokesperson also did not respond to a Nov. 8 request for comment about the agreement.